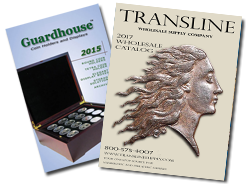 The Guardhouse proof set heavy duty box measures 10.75 x 5.75 x 3.62 and accommodates up to 24 proof sets, or 15 of the eight quarter special proof sets. This box does not hold prestige sets or premiere silver sets. Manufactured with a high quality textured exterior, the Guardhouse proof set heavy duty box features re-enforced tape filaments, which give the box extra strength and durability. Guardhouse heavy duty boxes are ideal for storing, shipping and transporting. Boxes are made in the USA.